Crisis is an event which harms an organization, its facilities, its finances or its reputation within a short period of time. A crisis can occur as a result of an unpredictable event or as an unforeseeable consequence of some event that had been considered a potential risk. In either case, crisis almost invariably requires that decisions be made quickly to limit damage to the organization. Crisis management is the application of strategies designed to help the organization deal with a sudden and significant negative event. Crisis management is the art of making decisions to head off or mitigate the effects of such an event, often while the event itself is unfolding. This often means making decisions under stress and without the support of key pieces of information. Crisis management is the management and coordination of the organization’s response to an incident that threatens to harm, or has harmed, the organization’s people, structures, ability to operate, valuables and/or reputation. It takes into account management’s planning and automatic incident response, but must also dynamically deal with situations as they unfold, often in unpredictable ways. The study of crisis management originated with the large scale industrial and environmental disasters in the 1980s. Under the present day environment crisis management is an important and necessary component of managing an organization since in the current day situation, no organization is immune to crisis. Crisis may hit an organization in the shape of terrorist attack, industrial accidents, product recall or natural calamity etc. Crisis management is closely linked to public relations where the organization’s image and pride are at stake. Following three elements are common to a crisis. Crisis is a process of transformation where the old system can no longer be maintained. Therefore there is the need for change. If change is not needed, the event could more accurately be described as a failure. Unlike risk management, which involves planning for events that might occur in the future, crisis management involves reacting to an event once it has occurred. A great deal of crisis management occurs before a crisis begins. It is about planning and preparing the organization for a crisis. Planning relates to getting the organization in the best position to react to, and recover from, a crisis. There are following two elements of planning that are unique to managing a crisis. The goal is to have employees to know when to report an incident which has a potential to become a crisis if not attended upon. Creating escalation rules for the employees is an essential element in crisis prevention, detection, and control. This means that the employees are trained to bring matters to the attention of senior personnel for their analysis and handling as soon as possible, preferably before they become critical. Management must work to create a culture where employees can communicate these incidents to management’s attention without fearing overreaction or any negative consequences to the reporting employee. Without such culture, a developing crisis may go unnoticed by senior management until it develops and turns into a calamity. Second key element of getting the organization in the best position to react to, and recover from, an emergency due to a crisis relates to the creation of a crisis team that is ready to quickly come together to help manage the organization’s way through a crisis. The senior management of the organization must establish a mechanism for pulling together a crisis team during a crisis. It should identify the key players who will be on a crisis management team, based on their specialties, willingness to serve, and personalities. Management should also identify the employee who should lead such team during a crisis. Also a team member must be given responsibility of locating and bringing the crisis team together at the time of crisis for dealing with the crisis as it unfolds. The first task of the crisis team is the restoration of command, control and communications during a crisis while gathering as much information as possible, so that the directives of the senior management are well informed and effectively implemented. The crisis team leader should be able to be reached 24/7. Similarly, the crisis manager should be able to reach the members of his crisis team 24/7. Incident response is the automatic process that the organization puts into place to ensure that employees and systems react properly to an incident as it occurs. The more standard procedures the organization can put into place, and on which train the employees, the less likely the organization is to encounter confusion and chaos when a crisis occurs. Such automatic processes involve careful planning. The key point is the awareness that, during a crisis, it must be recognized that the senior management is not likely to be the one who will face the crisis from the front and the employees who are confronting the situation may be forced to take decisions on the spot. While it would be preferable if the employee could consult a senior management about what to do during an emerging crisis, in reality, this employee may not have time for consultation and have to act immediately for the safety of the entire organization and its constituents. The crisis planning must be cognizant of this fact and should seek to appropriately empower such employees with the knowledge of when and how to act. There are a few related schools of thought about crisis management. These are described below. In a crisis, a crisis team leader can do everything right — using all available information and the best possible judgment — and the decision can still make matters worse. This rule is perhaps most important — and the most difficult. To the extent a crisis team leader can recover from making a bad decision during a crisis, he has a hope of guiding the organization forward. To the extent that the crisis team leader is incapable of personally and psychologically recovering from making a bad decision, he will likely fail — or make things even worse than they have become. The crisis team leader will never get perfect information during a crisis situation — and he will succeed only where he is capable of making a decision in the absence perfect information. If he is incapable of making a decision under conditions of grave uncertainty or confusion, then it is unlikely that he will succeed in a crisis. Decisions made during crisis are normally reviewed by hindsight. It is a harsh reality that once a crisis has subsided, anyone not directly associated with the decision making process (and perhaps some who were) begins to critically examine every decision the crisis team leader has made. In some cases, as the dust settles, blame may be assigned, enquiries may be constituted, and jobs may be lost. Crisis team leader who is daunted by this prospect may be paralyzed or take perceived ‘safer’ decision paths that may make matter worse. Upon the determination that a crisis has arisen, the crisis team leader should focus his attention on managing the crisis, while the crisis team members are located and brought together. A crisis team in action should have the following features. The crisis team leader will be in charge of the crisis team and making decisions as the head of the team. In the absence of the team leader no decisions will be made, especially because people often resist decision making because of the risk involved in making decisions. The crisis team leader serves as key liaison between the organizational management and the crisis team. Crisis is not the time for democratic decision making. They are also not the time for autocracy. The crisis team leader and the organization management need to hear the advice of the crisis team and make decisions in light of — but not necessarily deferring to — those recommendations. One key role of the crisis team is to ensure that the best information available is received by the organization management — and that the orders, decisions and communications of the organization are able to be shared with their intended audiences. This will allow management to manage the crisis as effectively as possible, and can minimize the risk that uninformed, dissident, or panicked voices will fill the vacuum. The following is essential for an effective command, control and communications. It is essential that a decision maker be identified, that this person have the authority to act and that the decisions can be effectively communicated to those who need to know. It is important to recognize that senior management may be unavailable during a crisis. Thus, it is important to be able to quickly ascertain who is in charge at any given point. This information should be available with the crisis team leader for important consultation at the time of crisis. A command centre (control room) is necessary at the time of crisis, the place where decision- makers meet during an emergency and establish command, control and communications. All the critical information is to be available at this location. The telephone numbers, fax numbers, and email addresses of key managers, stake holders and media contacts are to be available at the command centre. It is to be ensured that employees know how to reach the command center for reporting of the information. It is necessary to have redundant communications systems. To the extent possible, being able to reach out and be reached by more than one means may make the difference in a crisis. For instance, during a blackout or similar emergency, SMS may work better on cell phones than cell phone calls themselves. Besides preventing what may be counterproductive or, worse, deadly confusion during an incident, having an effective communication plan also helps to manage those outside of the immediate incident, including those who need or want information, such as the media and stake holders. It is also essential to designate a single spokesperson for the organization. If it is necessary to have more than one, it is essential that they carefully coordinate their message. This spokesperson should be the sole contact point for the media, stake holders and anyone else who needs information from the organization. Information should be clear, factual, non-emotional and consistent with law enforcement requirements. The person designated to be spokesperson should not have other, more important duties to attend to during an incident and recovery. The spokesperson’s job is to convey information. Therefore, consider how engaged in the emergency and follow-up any potential spokesperson should be. The media may be interested in the incident. They may also be the most effective way to communicate important information to the stakeholders. Media may be more or less receptive to becoming a conduit for relaying information. However, if the organization does not wish to draw undue attention to the incident, it may not to call the media. However media can find out about incident without organization calling them — they have other sources. Thus, though organization may wish to avoid media attention, it is sometimes inevitable. When speaking to the media, the spokesperson must be clear, direct and honest. He should speak in short, declarative sentences. (e.g., ‘the facility will remain closed for the next two days’). He must decide what to be conveyed to the media before they interview him. Any question is to be answered with concise, stock statements. As the organization gains more knowledge about the incident causing crisis, more ‘command, control and communications’ is to be asserted and the organization ability to impact a situation should increase accordingly — to a point. As time passes, outside forces, including media, alternative voices, and other ‘noise’ can interfere with the organization ability to manage and have an impact on the situation. At the same time, organization ability to keep control and gather new information may degrade. In short, the faster the organization can increase its ability to gain knowledge and establish command, control and communications, the more time it will have to be influential. Recovery from the crisis is a critical part of post incident work. Recovery is much easier if preparation is done beforehand. Further recovery consists of assessment of the damage, speedy bringing to the normalcy, quick restoration of the affected facilities and learning the lessons from the crisis, mitigation of the long term consequences and taking measures for the avoidance of similar crisis in future. Some issues related to the preparation for recovery from crisis are as follows. To maintain off-site, current backups of critical data, vendor, employee and contact lists, and other organization-critical information. Backup security is vital. To conduct an insurance review to ensure that insurance is adequate to cover all the organizational needs. Keep insurance records with backup information. Inventory everything that would cause the organization to cease operations if destroyed. Carrying out of the morale building exercise for the employees and the stake holders. Assessment and enumeration of damage. Analyzing the cause of the crisis by a fact finding committee. Carry out restoration of the facilities modified to avoid similar crisis in future. Documentation of the entire event for record and for use as training aid. Modification of the procedures and other documents based on the lessons learnt so as to avoid repetition of the crisis. Training of the employees in the revised procedures. 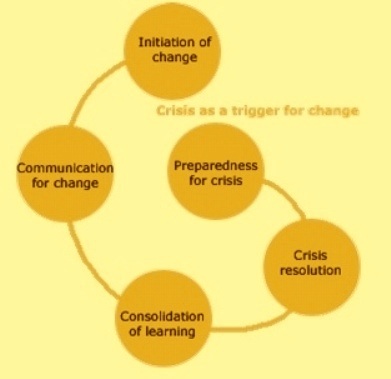 Fig 1 below shows how the cycle of identifying crises, managing them, and more importantly extracting learning from the act of managing the crisis and communicating the learning as a trigger for initiating a change programme to overcome the vulnerability of the organization, can take the organization to higher orbit of maturity and performance.